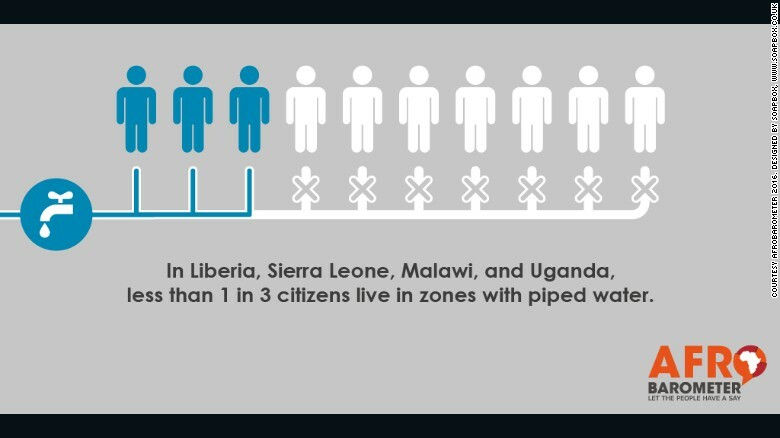 (CNN) In Africa, less than one in three people have a proper drainage system, half of the population live in areas without paved roads, and only 63% have access to piped water. 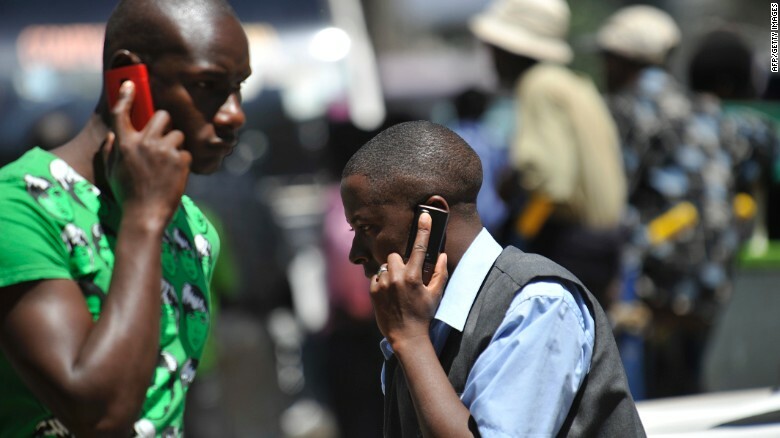 Yet, 93% of Africans have cell phone service. These are among the findings in a recently published report by Afrobarometer, a pan-African, non-partisan research network which explored access to basic services and infrastructure in 35 African countries through about 50,000 face to face interviews. “In a lot of communities all over Africa, people can talk on their cell phones, but they can’t turn on a light or a water faucet. Never mind flush a toilet. And they may be going hungry,” says Winnie Mitullah, lead author of the report. “As far as the most basic services that many of us take for granted — water, sewage, electricity, roads — an awful lot of people might as well be living in the 19th century,” she continues. The survey found that in some rural areas less than half of residents have basic services such as electricity. The gap between services in rural and urbanized areas ranges up to 90 per cent in some cases, for example for piped water in Zimbabwe. “The data reflects the precarious situation that many Africans are in,” says Romaric Samson, co-author of the report. “This is more than an inconvenience — kids get sick and die when there’s not enough clean water to wash with and there’s no safe disposal of sewage. There are also big differences between provisions from country to country. In Mauritius and Egypt access to the electricity grid and piped water are universal, whereas only 17% of Burundians live in zones with an electric grid, and only 17% of Liberians have access to piped water. North Africa has the best availability of essentials services, while East Africa has the worst. “Things have improved slightly over the past decade, but that progress has generally been slow, and large parts of the population are still left out, especially in rural areas. With the exception, once again, of cell phones,” says Mitullah. Analyzing data from 18 countries, Afrobarometer plotted the progress of the availability of essential services since 2005. 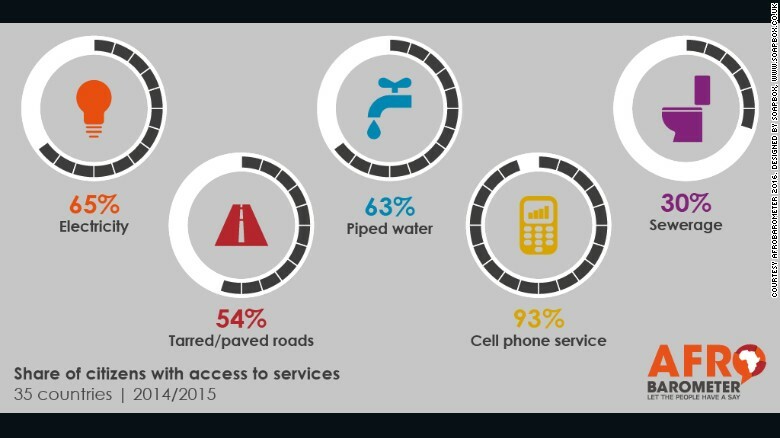 The most significant increase was in cell phone services (23%), but road infrastructure (16%) and access to water and electricity also registered a tangible increase (14%). Of all the basic services, sewerage systems progressed the least: just 8% in 10 years. “There’s only one way this data can change things, and that’s if people use it to make good decisions,” Mitullah continues. “If you see that in Liberia, four out of five people don’t have access to piped water, that’s a fact that’s hard to ignore. “Or if you see that in rural areas in Burundi, Malawi, Niger, Sierra Leone, and Tanzania, 0% – that’s zero percent! — of the population has access to a sewage system, that raises a question, doesn’t it? What are you going to do about it? “We put that information out there. If governments use it to make decisions about spending priorities, or development partners use it to plan their programs, or activists use it to force the other two to use it, then it becomes powerful.